The Surveying Process: Each Promotora is paired up with a SANDAG staff person in Bilingual teams and work 6 days a week. Cyndi Gonzales has lived in the Castle Park area of Chula Vista for more than 30 years. This is the community where she grew up. She said she loves her community, that is why it hurts her to know that, historically, Castle Park has the lowest performing schools in the city, and is home to many low-income families. “This area is very dear to my heart, because I grew up here, I went to school here,” said Gonzales, whose children are now growing up here. But Gonzales decided to take action, and has become a leader in the implementation of a survey that will help to better understand the needs of the Castle Park community. The survey, which began early this month, is part of a $500,000 Promise Neighborhood grant that South Bay Community Services (SBCS) received from the federal government to plan the revitalization of the Castle Park area with the help of a variety of community partners. SBCS was one of 15 organizations nationwide that received this grant. The Campo Band of Mission Indians also received one of the grants, which were announced in December. Of those 15, five organizations will receive up to $6 million for the first year of implementation of their programs. Those organizations will get up to $30 million during the life of their grants. The Promise Neighborhoods program aims to address significant challenges faced by students and families living in high-poverty communities by providing resources to plan and implement a continuum of services from early learning to college and career. 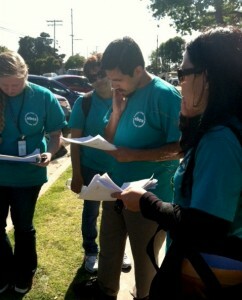 “It is predominantly a Spanish-speaking area,” said Rachel Morineau, Promise Neighborhood Program Coordinator for SBCS. Morineau said that at this first planning stage SBCS, with the help of the San Diego Association of Governments (SANDAG), is conducting the community need survey. For this, they hired promotoras who are going out to the community and randomly select households to participate in the bilingual survey. The goal is to complete 600 surveys by April 30. “These promotoras are very passionate about their community,” Morineau said. She added that the pro-motoras live in the Castle Park area, so it would be easier for families to talk to persons they know and with whom they can relate better. SBCS will submit their proposal for the implementation grant later this year. Although it is a very competitive process, Gonzales, the Castle Park resident, said she believes this will revitalize Castle Park. South Bay Community Services is the region’s largest provider of social service, education, and community development programs for youth and families. To learn more about its programs, please visit www.southbaycommunityservices.org.